A University of Houston pharmaceutical scientist is developing a new drug which could bring relief to children suffering with Familial Adenomatous Polyposis (FAP), a rare genetic disorder characterized by hundreds—if not thousands—of colorectal polyps. This hereditary cancer predisposition syndrome occurs in 3-per-100,000 live births and, if left untreated, causes colorectal cancer in patients nearly 100 percent of the time. Prior medication for the disease failed because it increased the risk of heart attacks and death. “If successful, this drug will likely become the first drug for treating children with FAP and will also be useful for colon cancer prevention in other high-risk populations,” said Ming Hu, professor of pharmaceutics, who is using a $200,000 grant from the Cancer Prevention Research Institute of Texas (CPRIT) for a pilot study of the new drug’s effectiveness. Hu’s research team includes Greg Cuny, UH associate professor of medicinal chemistry, and Jason Eriksen, UH associate professor of pharmacology. Children with FAP have to undergo routine colonoscopy and surgery (removal of polyps and intestinal segments) until the whole colon is eventually removed via colectomy. “The quality of life for children with FAP remains very poor,” said Hu. Untreated, the disease causes growth of an out-of-control number of polyps that will progress to malignancy. For those who are undiagnosed by age 20, Ming says their life will probably end by 35, because the polyps will become numerous and malignant, leading to severe hemorrhage and deadly metastatic cancer. To make matters worse, the Food and Drug Administration, which earlier approved the cyclo-oxygenase-2 (COX-2) inhibitor celecoxib to treat FAP, had the FAP indication withdrawn because of the drug’s sometimes fatal toxicity to the heart. Scientists attribute the drug’s toxicity to the fact that it spreads throughout the body, rather than targeting only the affected organs. 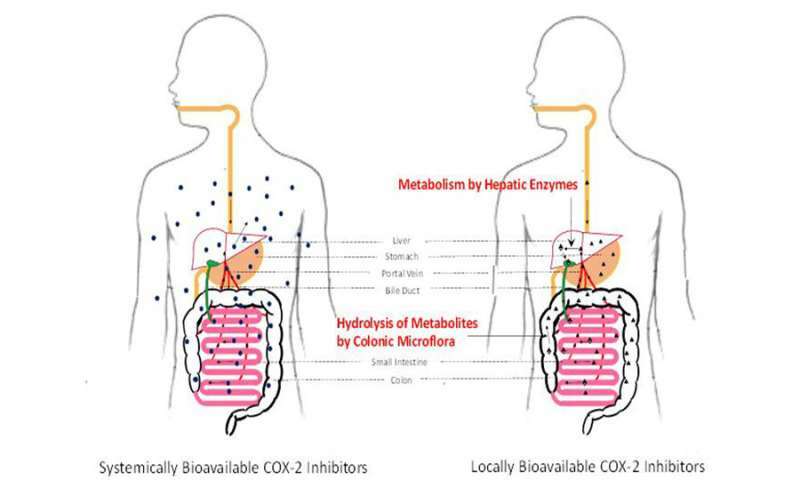 COX-2 inhibitors are a type of nonsteroidal anti-inflammatory drugs, many of which have the same non-targeted organ toxicities. To call attention to these severe side effects, the FDA has ordered a “black box” warning be printed on the drug’s package to mark this life-threatening risk. As a result, children with FAP are left with no drugs for treatment. 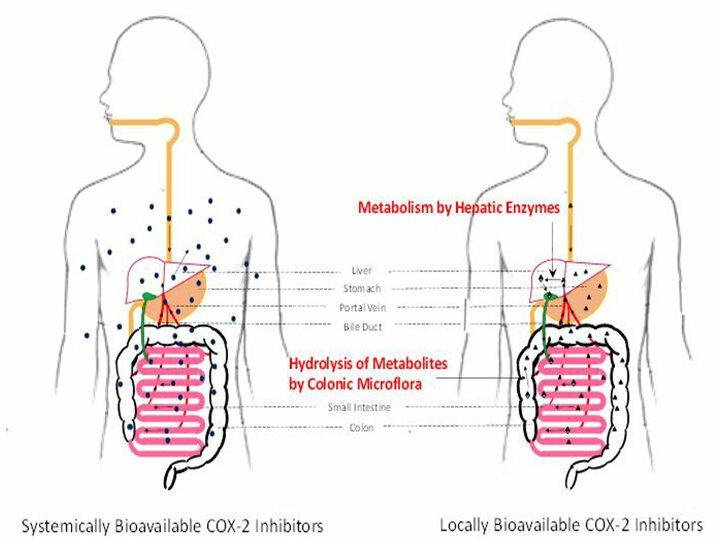 Hu and his team took this opportunity to develop a more effective treatment through a locally bioavailable COX-2 inhibitor, meaning one that will remain inside the gut area. The new drug is designed to cycle through the colon without escaping to the circulatory system and reaching non-targeted organs. The drug inhibits the production of the molecule called PGE2, which magnifies pain and promotes tumor growth in the colon. Hu says the drug will also be effective for preventing recurrence after the polyps are removed, which could lead to fewer incidents of colon cancer in high-risk populations.